Please note that product images are enlarged to show detail. The actual item is 0.489 - (approx. 1/2 in.) inches long and 0.468 - (approx. 1/2 in.) inches wide. 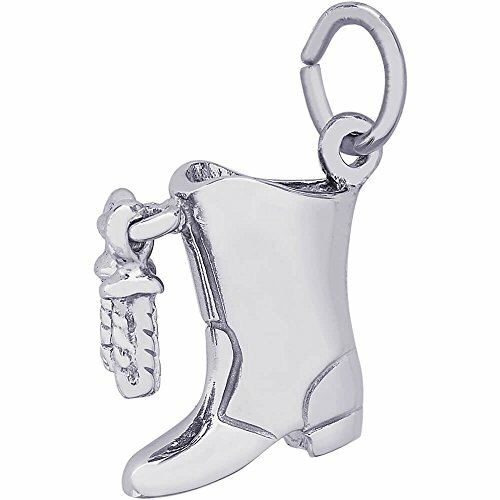 The Drill Team Boot Charm, 14K White Gold is hand-polished with a Satin finish. The charm shape is 3D. Every Rembrandt charm comes with a heavy-duty jump ring that can be twisted open and easily attached by you. All Rembrandt Charms are guaranteed for life. If you have any questions about this product by Rembrandt Charms, contact us by completing and submitting the form below. If you are looking for a specif part number, please include it with your message.